Images of Sony's Motion Controller device have broken cover, and it looks, er, interesting. Announced at E3 in June, the Sony 'wand' has intrigued many a gamer since the concept was revealed. The controller is set to take PS3 users into Wii gaming territory and has a release date of next spring, according to Sony. The news was revealed at this year's Tokyo Game Show. Sony's Kaz Hirai was in attendance, and mentioned that the controller was "very accurate" and "enhances" reality with its vibration feedback. 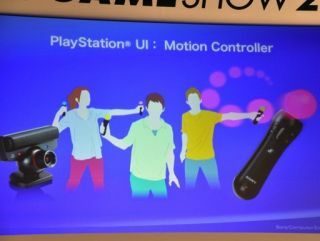 In a press release, the controller is said to be "equipped with high-precision, highly accurate motion sensors" and "can deliver whole new entertainment experience on PS3 when combined together with the PlayStation Eye camera." As it uses the Eye camera, the controller is also "capable of recognising and tracking a user's face and voice as well as body motion." The press release continues: "[The] PlayStation Eye can also output the player's image onto the TV screen. SCE will vigorously promote the expansion of this new experience only possible on the PS3 platform." From the look of the images (courtesy of Joystiq) the controller is the cross between Doctor Who's Sonic Screwdriver and a light bulb. In fairness, it does look very similar to the patents Sony logged back in November of last year, so the design of the thing has been in the minds of the company for a little while now. Even if it looks a touch strange. Some of the games that will be compatible with the controller include LittleBigPlanet and Resident Evil 5. It's unknown whether this will be through backwards compatibility or DLC, however. It will be interesting to see if the Motion Controller is a success on the PS3, as the console is better known for its 'serious' games. But the proliferation of titles like Guitar Hero, Buzz and SingStar does show that PS3 gamers don't shy away from a little bit of gaming peripheral fun.